Two of the injured service members are being treated at a nearby medical facility, and the other two have returned to duty. An American service member was killed and four others wounded during combat in Afghanistan's Nangarhar province. According to a statement released by U.S. Forces Afghanistan, two of the injured service members are being treated at a nearby medical facility, and the other two have returned to duty. Their names were not released. 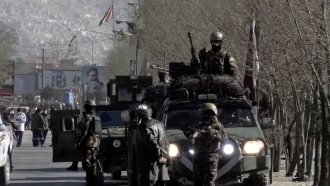 There are currently about 14,000 U.S. troops stationed in Afghanistan to help the country's military battle the Taliban and ISIS. A total of 15 American service members died in Afghanistan in 2017.